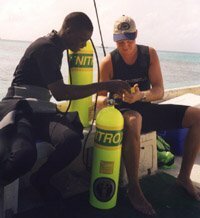 Enriched Air Nitrox sometimes called NITROX is Recreational Diving’s latest tool to extend no decompression time, and has significant benefits especially in the 15 – 30 METRE range. However you don’t get something for nothing . You’ll learn Enriched Air extends dive time by replacing some of the Nitrogen in air with Oxygen, therefore less nitrogen is absorb by the body during a dive of equivalent time. 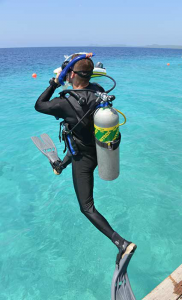 The higher Oxygen brings with it new concerns that you don’t have using air within recreational dive limits. The training covers the equipment procedural concerns, planning requirements for enriched air use, Oxygen toxicity, and enriched air and formulae use. For extra information about using Enriched Air Nitrox see information below course details. NOTE: Our shop now has an Enriched Air Membrane. These machines cost in excess of $20K but enable to us pump nonstop enriched air at a very cheap cost. We also have storage banks with 32% enriched air being the most popular blend for deeper diving. This means we can give you a simple fill and go procedure (the same as an air fill ) no waiting around for complex blending. We deliver Nitrox at almost the same price as other shops charge for an air fill! Due to our flexible self study program we can tailor the course to your needs. Sessions conducted weekly. Conducted weekly at the Dive Shop.